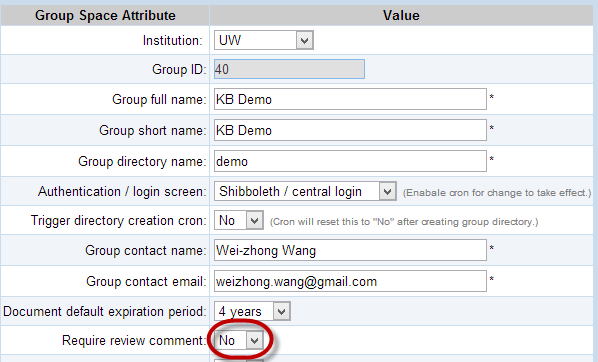 KB Site Administrators can decide whether or not authors are required to enter comments when revising a document. To change this setting go to KB Admin Tools > Site Pref tab > Group Spaces link. Your KB Group Name should be on the top of the list. Click on the Edit button on the far right. This will take you to a screen called Group Spaces. Under the Document default expiration field in the table presented, there is a field called Require review comment. In the image below, the Require review comment field has its Yes/ No drop down menu circled in red. No (comments optional): Comments may be entered when changing the status of a document, for example when setting a document to "In Progress". Yes (comments required): Comments must be entered when changing the status of a document, for example when setting a document to "In Progress". When the Require review comment dropdown field is set to "No", the text area for the comments field shrinks to two lines and the field name is displayed as Review Comments (optional). Otherwise, the text area is bigger and the field name shows up as Review Comments (required). When comments are required, text must be entered before reviewing/editing the document.